Justin has been performing professionally his entire adult life. 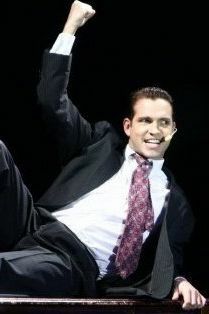 Some of his favourite credits include Danny Zuko in Grease, Joseph In Joseph and the amazing Technicolor Dream Coat, Sky u/s in the Toronto production of Mamma Mia and Featured as lead vocalist In Deerhurst resorts Review Style show. Recently, Justin has been sailing the ocean performing for Celebrity Cruises in their main stage shows. Where he finds himself constantly challenged to lead his casts toward tighter and more thrilling shows as Company Manager. Also he is often asked to host televised tours of the ship and theatre. This opportunity has introduced Justin to a new talent, the ability to work a camera the same way he has worked the stage for years. Justin’s ultimate goal is to constantly hone his skills as an entertainer and challenge himself to reach new heights with each project he takes on. With creativity, personality plus and a great east coast work ethic. Justin is a wonderful addition to most any project, on stage and off.